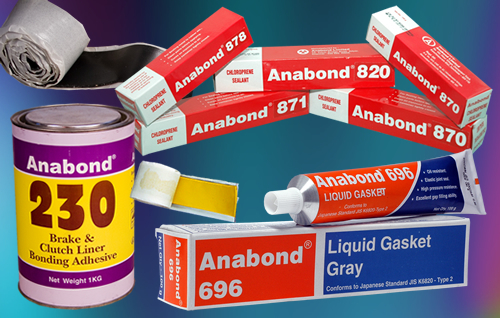 Anabond’s Rubber Based Adhesives & Sealants are Single component, room temperature curing, which exhibits high performance, possessing very high adhesive strength and suitable for bonding different substrates. Single component – Easy to apply. Anabond was established in the year 1979, for developing, manufacturing and marketing of Engineering Adhesives and Sealants. Anabond is the first Indian company to manufacture Anaerobic Adhesives & Sealants, RTV Silicone Sealants and Single component epoxies. Today Anabond Products include Anaerobics, Epoxies, RTV Silicones, Polyurethanes, Rubber Based (Chloroprene & Butyl), Acrylic, Solvent Based Adhesives, Cyanoacrylate, Specialty Coatings etc. with more than 300 products. These products are used as a raw material for the manufacturing industry or for the service of different processing industries. Our adhesives find diverse spectrum of applications in products right from Disposable Syringes to Space Vehicles. Anabond still remains to be the largest manufacturer and supplier of liquid gaskets for Indian automobile engine & transmission in India.